"It's nice to be liked, but it's better by far to get paid." So says the song "Money" by Liz Phair. As a software tester, you are both liked AND well paid, according to recent studies. Learn more below. According to Forbes, "The happiest job of all isn’t kindergarten teacher or dentist. It’s software quality assurance engineer." The article goes on to say, "In past studies, we have noted that the long hours and intense demands on software engineers’ time caused them to rank as less than happy. However, we are happy to report that software quality assurance engineers feel rewarded at work, as they are typically the last stop before software goes live and correctly feel that they are an integral part of the job being done at the company." Robert Half Technology has also declared that you are #3 on the list of the "5 Tech Professionals Firms Want Now". From the report: "With more dollars available for IT projects, managers are focusing on quality control and assembling more accurate project requirements. Quality assurance professionals can relieve developers so they can focus on coding, while business analysts can help build trust among stakeholders and serve as go-betweens for technology and business." Blizzard Entertainment is looking for intelligent and highly motivated senior testers to test our games, and support applications. Ideal candidates must have strong technical skills, troubleshooting ability, communication skills, and a solid understanding of quality assurance. Applicants must be able to work on weekends, day or night shift. If you are an ASTQB certified tester, you can see the requirements and contact information for this and several other jobs at the ASTQB Certified Tester Resource Area. Do you have a job to post? Post your job openings and search resumes at no cost in the ASTQB Career Center. ASTQB is happy to announce that a Latin American Spanish version of its Foundation Level exam is now available for electronic exams at its test centers. Register for the electronic exams. Note that the registration form is in English, so basic English skills are required for registration. A long-awaited upgrade of the 2007 Advanced Level syllabus is almost ready for distribution. A major objective of the new Advanced Level syllabus has been to ensure that there is no overlap between any current ISTQB syllabi. Thus, there are clear and consistent distinctions among the topics expected to be mastered for certification as Test Analyst, Technical Test Analyst, and Test Manager. The Advanced syllabus adds to the Foundation Level and provides a logical bridge to the topics to be addressed at the Expert Level: Test Management, Improving the Test Process, Test Automation, and Security Testing. See the chart below in the next article for a graphic overview of the levels. More details are available in the syllabus and the ISTQB announcement. ASTQB Director Taz Daughtrey presented “Certifying Software Security Testers” on October 10, to the annual conference of the Virginia Alliance for Secure Computing and Network (VASCAN). The VASCAN is a network of security professionals within higher education. 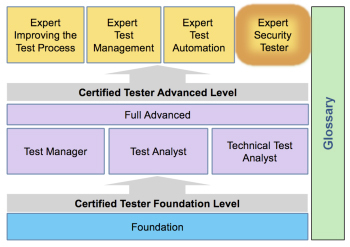 Daughtrey summarized the wide range of existing certifications – such as “Professional Security Tester,” “Licensed Penetration Tester” and “Certified Ethical Hacker” – as well as the observed minimal contribution that such designations have made to improving software quality. He then provided an overview of the ISTQB and its tiered certifications and rigorous development process. Daughtrey highlighted the ongoing project to add an Expert Level for Security Testing, an effort being led by ASTQB Director Randy Rice, and invited comments and ongoing participation. Attendees at the conference provided feedback on the perceived usefulness of the certification and suggested other communities with whom to dialog. The conference also included presentations and panel discussions by university CIO’s and Information Security Officers. ALP International (ALPI): Looking to get your team ASTQB/ISTQB Foundation Level Certified in 2012? Exclusive offer to Newsletter readers of 20% for ALP International’s training and exam November 26-28, 2012. Use Promo Code* TESTCERT2012 when registering. For onsite training in HP or Microsoft test tools and courses on test process, and for information on our Bulk Training Program which can save you up to 40% on training fees, contact our Training & Education Team at training@alpi.com or 301-654-9200 ext. 403. *Promotion Expires October 31, 2012. RBCS: In honor of the release of the new Advanced syllabus, RBCS is pleased to announce that it is submitting for accreditation both its updated Advanced Test Manager and Advanced Test Analyst live courses. Contact RBCS to be the first to sign up for new Advanced courses, and we'll give you a 20% discount on new Advanced trainings booked before November 30. Visit our store and enter the promo code ADV12 in your cart to take advantage of this offer. Updated course schedule to be posted November 1, 2012. Contact us at info@rbcs-us.com if you have any questions at all. Rice Consulting Services: Rice Consulting Services is offering a special bonus on Foundation Level e-learning team pricing. Enroll five or more people in pre-recorded e-learning CTFL training and get one extra registration free, including exams and textbooks. Use code "ISTQB7" at www.mysoftwaretesting.com when purchasing the 5-person enrollment. SQE: Close out 2012 with Advanced Level certification and save. SQE Training is offering a special $300 discount on our October 29th Advanced Certification Week in Bethesda, MD to subscribers of the ASTQB newsletter with promo code ASTQB. Discount is valid only on new registrations and requires a full 5-day registration. We also offer Foundation Level classes.